On March 26, Mary Friesen introduced the Society to the Goring family of Niagara. Francis Goring was born in England in 1755. On the eve of the signing of the Declaration of Independence, Goring arrived in Quebec. He soon moved to Fort Niagara where he worked as a clerk in the fur trade. Through surviving letters and journal entries, it is apparent that Francis enjoyed living in the Niagara area. He settled permanently and raised a family. One of Francis’ children was Abraham Hamilton Goring who also settled in the area and had a family including a son – Ransom Goring (born in 1842). Like his grandfather, Ransom was a dedicated journal writer. He would comment on the day’s events regularly and would even take extra time on Sundays to reflect on the previous week and add to his entries. Mary Friesen found three years of Ransom’s journals in the Niagara Falls Library and was compelled to transcribe and publish his words. The journals span the years 1867 to 1869 – critical years in Canada’s history. Not only does Ransom’s works chronicle the daily life of a Niagara resident but it also sheds light on a number of other interesting topics such as Canada’s militant feelings following the Fenian Raids, the spas of St. Catharines, weather, the social culture of the area, politics, education, courtship and marriage, and shipbuilding. What better way to understand the past than through the words of one who experienced it. Friesen’s book is entitled “Renascentur: The Datebooks of Ransom Goring”. Renascentur was the family’s motto and means “They will rise again” in Latin. Generations ago, there were villages throughout Niagara that held much promise for the future. They had general stores, schools, churches, mills and more. Fast forward 100 years and some of these villages are not even on a modern day map. Perhaps merely a footnote in a history book. What happened to these villages? Why did they disappear? And what evidence is left of their existence? Join the St. Catharines Historical Society on April 24 at 7:30 in the St. Catharines Museum to hear Society President John Burtniak reveal the fate of these villages of yesteryear. On Thursday night (March 27), the Society was treated to another information packed presentation by Professor Alun Hughes. Entitled “‘Lord’ Simcoe, Lady Godiva and the Naming of the Niagara Townships”, the talk looked at how many of the townships, towns and other landmarks in the Niagara Peninsula and throughout Ontario were named during the tenure of Lieutenant Governor John Simcoe in the 1790s. Beginning with a wide view of all Upper Canada, Alun demonstrated that many of the counties in Upper Canada were named directly after the counties along the eastern coast of England – starting with Kent all the way through Northumberland. The Niagara Peninsula was given the name Lincoln County after Lincolnshire County in England. As such, many of the place names within Lincoln County can find their roots in Lincolnshire – examples: Gainsborough, Grantham, Grimsby, Louth, Newark (now Niagara-on-the-Lake), Saltfleet, Stamford and the Welland River. Other place names stem from influential individuals and families from the time like Sir John Thorold, the Pelham family and Clinton Family. Still more names were to come much later or were derived from contemporary First Nation place names. One of the most interesting findings to come from Alun’s presentation was the discovery that Simcoe’s reputation of not being in favour of First Nation place names is false according to surviving evidence. 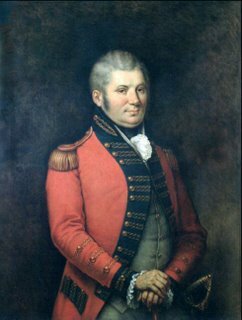 For generations, Simcoe has carried a legacy for changing established First Nation names to English names such as Toronto being changed to York and Niagara being changed to Newark. Alun proved that the shift to these new place names had occurred prior to Simcoe’s appointment as Lieutentant Governor. Plus, Simcoe was more apt to change place names of French and German origins rather than First Nation. More importantly to this area, Simcoe openly advocated that Newark be renamed Niagara later in his term. The English government agreed and adopted this change. Alun proved once again that there are a lot of errors in our history that are taken as fact after years of retelling and misinterpretation. With sound research and use of good evidence, these local myths can be corrected. Next month’s presentation will feature John Burtniak speaking on “Vanished Villages in Niagara” – April 24.